Quite frankly, I love this outfit. Simple palette and solid pieces, yet well thought out. As you can see, I have finally hopped onto the American Apparel riding pants wagon. I couldn't decide between safari brown or henna, so I got both colors. Typical. Although they are a little long for me (considering the fact that I am only 5'2"), they are quite flattering. I love them! Here, I am wearing the henna ones with a darling sage peter pan collar top, a vintage cardigan of a similar sage color, and a pair of vintage navy leather flats. The best part, however, is the bag. 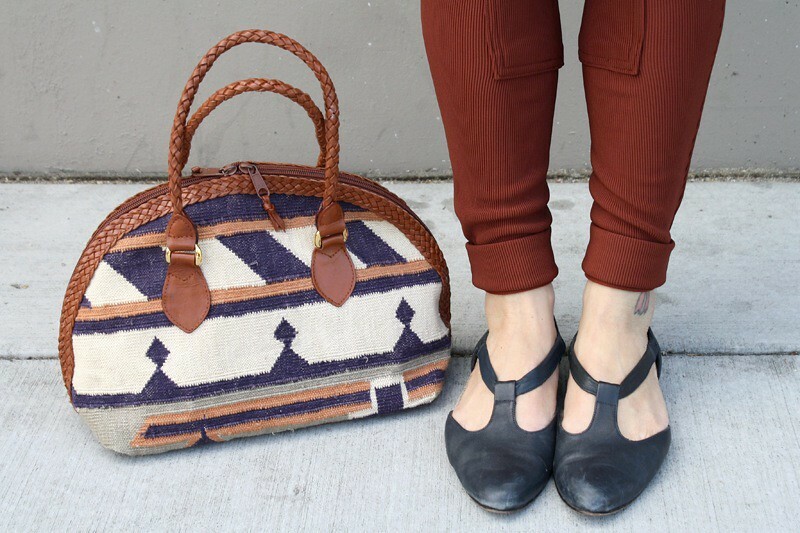 This awesome vintage woven bag tied the entire outfit together by having all the colors in its southwestern print - rust brown, sage, and navy! Thanks to Therapy Vintage who gifted me this lovely bag. This shop is filled with amazing and affordable vintage goodies, go check it out! 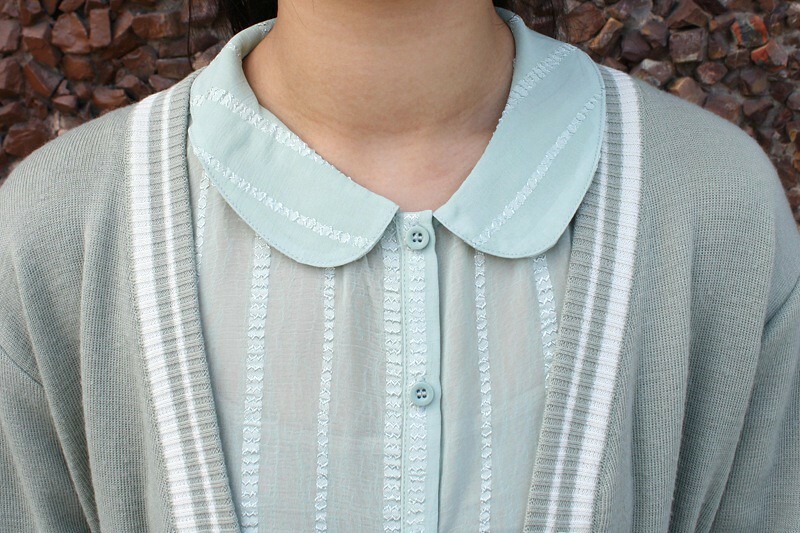 Sage peter pan collar top from F21. Riding pants in henna from American Apparel. Vintage navy leather flats by from Etsy. 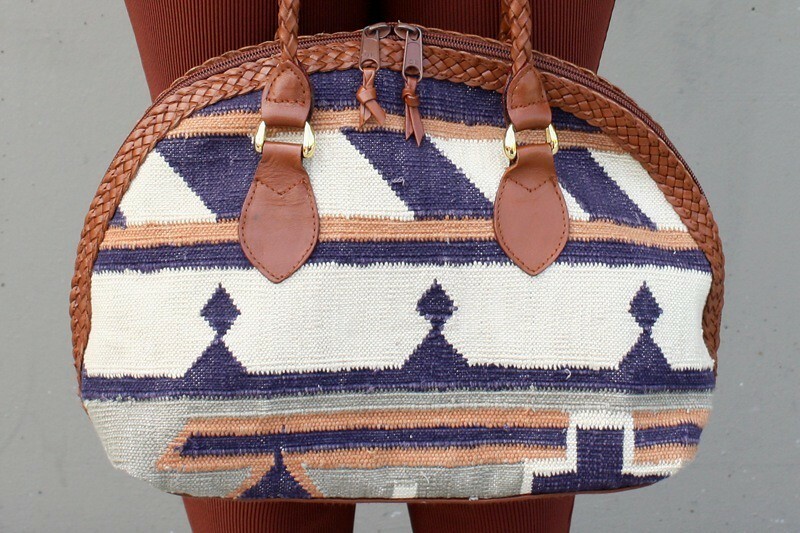 Vintage southwestern woven bag c/o Therapy Vintage. PS. Congratulations to Severine of The Clothed Chameleon who won the cross double finger rings giveaway! I will contact you shortly! Thanks to everyone who entered! I like how you styled the pants with the top & cardigan..lovely outfit, you look great! I'm on the same boat- on choosing between safari brown and henna :( ... Unlike you I can currently afford to buy only one :( & was wondering which one u preferred more? :-D which one do u recommend? hey there, if you must only choose one, i would suggest henna just because that rust burgundy color goes with more things. i LOVE the safari brown, it's such an unique color but it's definitely trickier. so, if you want something you can wear more and easier to match, go for the henna. but if you want something more unique and special, then go for the safari brown! whatever you pick, you will be happy and i guarantee you will want to buy another pair in the long run! What size are you? Lovely outfit, I definitely am purchasing Henna for my birthday!